Henry County has earned a national credential designed to show the strength of its workforce. 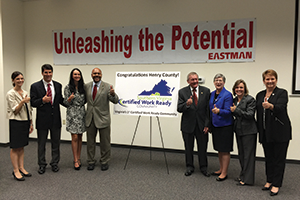 Iowa-based ACT Inc. designated the county as Virginia’s first Certified Work Ready Community (CWRC). ACT, known for its college entrance exam, issues the National Career Readiness Certificate (NCRC), verifying a worker has mastered essential skills for various industries and occupations. CWRC status helps cities and counties woo business prospects. The designation shows that their workforces have reached goals in three areas: high school graduation rate, number of career readiness certificates earned and number of employers recognizing the certificates. To earn certificates, workers must pass three assessments: using applied math, locating information and reading information. The certificate is awarded at four levels: platinum, gold, silver and bronze. “It’s been something that our whole region can work on together and see some success and tell a different workforce story than what the Census data tells about us,” says Julie Brown, director of advanced learning at the Institute for Advanced Learning and Research in Danville. She also is project director for the Dan River Region Collaborative, which addresses workforce development issues in Martinsville, Danville and Patrick, Henry, Pittsylvania and Halifax counties. Brown says Southern Virginia’s educational attainment statistics found in Census records don’t look as good as those from some other regions in the commonwealth, such as Northern Virginia. The Census, for example, notes the percentage of adults holding a college degree. That information, however, doesn’t provide a fair comparison, she says, noting that many Southern Virginia jobs don’t require college degrees but do require a high level of skills. “[The Certified Work Ready Community designation is] an appropriate tool to help our current employers, but it also gives our economic development folks a story that they can go out and talk to companies to say, ‘We do have a qualified workforce. Here is the data to back that up,’” she says. Eastman and more than 60 other organizations in the area recognize the certificate, including Bassett Furniture Industries, Carter Bank & Trust and Faneuil, an outsourcing support company. In the next few months Danville, Martinsville and Patrick, Pittsylvania and Halifax counties are expected to earn the CWRC designation. Emporia and Greensville County also recently launched initiatives aimed at obtaining the recognition.